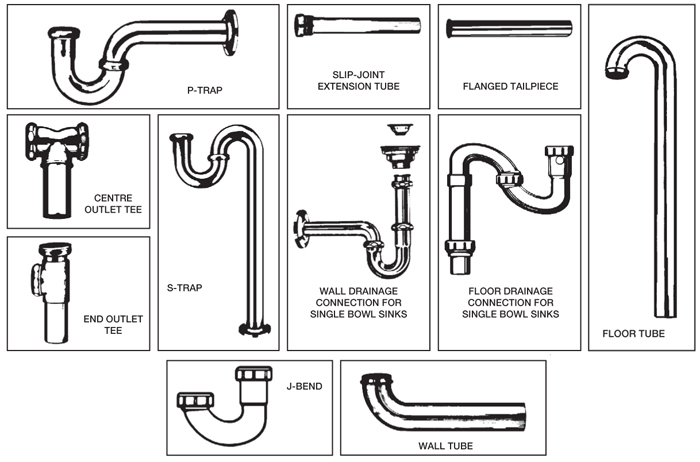 The heart of an under-the-sink drainage system is the “J-bend.” (Its name and the names of the other drainage components are derived from their similarity to letters in the alphabet.) The J-bend acts as a “trap,” preventing odours and potentially dangerous gases from seeping into the house from the sewer system. This “trapping” of odours is the result of water being retained in the curve of the J-bend, causing an air-tight seal. This water seal is renewed each time water flows through the system. The J-bend becomes a “P-trap” when connected with a “wall tube” and an “S trap” when connected with a “floor tube”. There are several specialized types of tubular components for different drainage systems. In cases where there are double-bowl kitchen sinks or two vanity sinks, centre-outlet continuous wastes or end-outlet continuous wastes are used, allowing the water from both drains to be funneled into one main drain pipe. 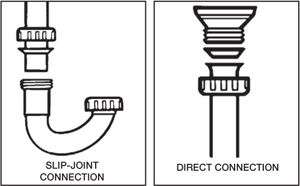 Both plastic and brass components are available in slip-joint and direct connect versions. In the slip-joint version, one unthreaded component piece “slips” through the nut and washer of its mating part and the nut is then tightened to make a compression seal. For a direct connection, the nut is slipped over a part with a flanged end. The part is then butted to its mating part and the nut is tightened. The nut holds the flanged piece tightly to its mate, forming a leak-proof seal. Plastic and brass components can be used together in a system because of the similarity in outside diameters and the use of the same thread sizes and nuts. Always use new washers when replacing a part. If the “slip-joint” nut is worn, replace it. Always use thread sealant tape or pipe dope on metal connections, but not on plastic connections. When cutting a drain component to size, remove all burrs from component to prevent blockage. Hand tighten plastic joints and wrench tighten metal joints. Remember, overtightening can strip threads or crack pipes. When tightening chrome parts, protect the finish by placing a cloth between the wrench and part, or put tape on the jaws of the wrench. When replacing a drainage component, bring the old part to the store to make sure you purchase the right size replacement part. Follow the manufacturer’s directions accompanying the product you are using.